It's been 16 years since the jump from Windows 3.1 to Windows 95. In that time we've seen mobile phones dominate train journeys, three atrocious Star Wars films and Sony ousting Sega from the console business, but we're still basically muddling around with the same desktop computer interface. We might have NTFS and transparent windows, but we still have the Start menu, the taskbar, the clock in the corner and the Recycle Bin. The basic Windows interface hasn't really altered in 16 years, but that looks set to change with the introduction of Windows 8, which Microsoft has just publicly demonstrated at the D9 conference. Julie Larson-Green, Microsoft's corporate vice president for Windows Experience describes the operating system's development as a 'reimagining of Windows, from the chip to the interface.' After owning the desktop computer for the best part of two decades, Microsoft realises that the computer industry is changing, and this means the OS needs to adjust in tandem. One of the main factors here is the popularity of tablet devices. With the hysteria surrounding the iPad, it's easy to forget that Microsoft started pushing the tablet concept itself back in 2002. But that was ultimately a flawed tablet concept – the virtual ink system worked well enough, but it was basically a flat Windows PC for people who wanted to annotate notes – it wasn't a user-friendly gizmo that let you go anywhere you wanted with the flick of a finger. Microsoft has also tweaked the Snap feature. This isn't just a handy way of putting one maximised app next to another one anymore. Instead, you can now slide a new app into the screen with your finger, a little bit like the pulldown menu at the top of an Android phone, and drop it in where you want it. This isn't anything particularly innovative, of course. We've seen most of this already in Microsoft's Windows Phone 7 operating system, as well as other touch-based interfaces. The difference is that Microsoft clearly sees this as the primary gateway into its next operating system. This doesn't look like a Media Center Edition-style shell that sits on top of a familiar version of Windows, either – it looks like a primary part of the OS. 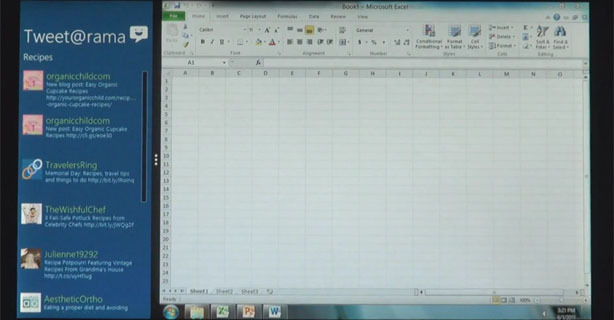 There's an interesting part in the demo video about three minutes in, where Harris shows the new OS running basic apps such as Excel. At this point, you see what looks like the familiar Windows Taskbar and Start button come into view, but then Harris slides in another app from the side using the tile interface. Of course, the only information we have is the small amount that Microsoft has chosen to share, but it looks as though the 'classic' Windows interface is a virtualised part of the new OS, rather than the foundation of the interface itself. How this works exactly remains to be seen, and we may be wrong. Either way, it looks as though the classic Windows interface will still be an option, but Microsoft is clearly trying to push the new interface as the standard way of interacting with Windows. The idea, according to Harris, is that this version of Windows will run happily on PCs, laptops and tablets. Windows 7 already does that, you might think, but there's also no getting round the fact that a Windows 7 tablet has a really clunky interface when compared with a 'proper' tablet OS, such as Apple's iOS.